Former WBC welterweight champion Victor Ortiz (32-6-3, 25 KOs) and former 2 division world champion Devon Alexander (27-4-1, 14 KOs) on Saturday night on Premier Boxing Champions on Fox at the Don Haskins Convention Center, El Paso. The judges scored the fight 115-113 for Ortiz, 114-114 and 114-114. Boxing 247 had Alexander winning a close 115-113 decision. The 31-year-old Alexander dominated the first 5 rounds of the contest in out-boxing Ortiz. During the second half of the fight, Ortiz came on and was able to outwork Alexander. 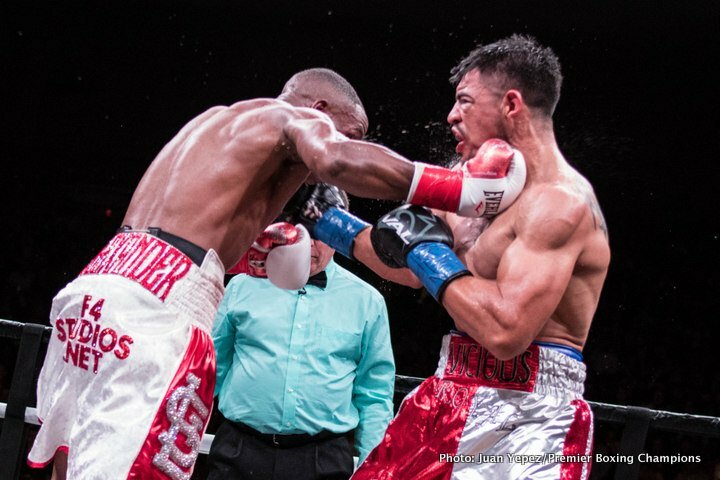 The 12th round saw Alexander getting the better of the 31-year-old Ortiz. In the co-feature, unbeaten super middleweight contender Caleb Plant (17-0, 10 KOs) won a dull 12 round unanimous decision win over Rogelio “Porky” Medina (38-9, 32 KOs) in an IBF 168 lb. title eliminator. The scores were 120-108, 119-109 and 117-111. Plant boxed most of the fight, throwing jabs and weak punches. He was not impressive at all, but Medina was even worse. With the win by the 25-year-old Plant, he’s not the mandatory challenger to IBF super middleweight champion Caleb Truax. Plant woould have a good chance of beating Truax if he can get to him before James DeGale. Plant will have a hard time beating the other champions at 168. He’s not powerful enough of a puncher. Previous boxing news: Results: Groves schools Eubank Jr.